Released in 1991, Morrissey’s Kill Uncle occupies an unusual place in the singer’s discography. Only his second album in four years after the breakup of The Smiths, the album ranged from the deeply sentimental There’s a Place in Hell for Me and my Friends to the quirky and pun-laden King Leer, with stops all over the map in between. Buried almost at the end of the album is a subdued little number called (I’m) the End of the Family Line. What has that to do with Gatecrash? Hopefully, nothing. But much like the narrative of the song itself, it’s hard to shake a certain sense of impending doom. Like most of Morrissey’s work, it’s not always clear when singing in the first person whether the singer is opening up his own personal feelings- or simply waxing lyrical- when he rues that having sired no issue he has brought the end to a family lineage that goes back fifteen generations. The sense of malaise that comes from the song extends from a feeling that this wasn’t entirely the narrator’s own choosing, that for one reason or another he was unable- not entirely unwilling- to ‘honour nature’ and continue the family name. 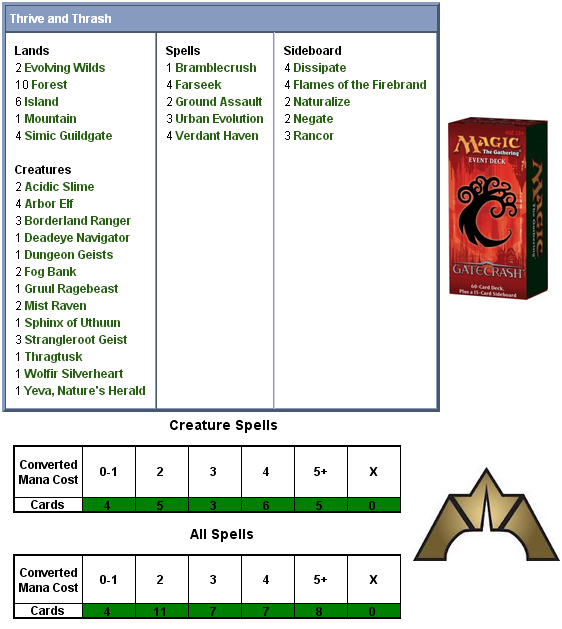 Since we’re on the subject of Event Decks, we should also mention that starting with Dragon’s Maze, there will be only one Event Deck per set, not two. Which means it’s going to take a pretty long time before we can construct a full 32-deck bracket to see which one’s the most powerful! The beginning of the end of the family line? Or simply rebalancing output to match demand? We can only hope that it is the latter. Although not without their little controversies around card selection and set content, the Event Decks have been a welcome player on the preconstructed scene since their introduction in Mirrodin Besieged. So as we dig into the two decks for Gatecrash beginning today with Simic’s Thrive and Thrash, take a moment to reflect as Morrissey did on the state of affairs, but perhaps try and take a little more cheer than he. After all, it’s only a game! Thrive and Thrash, for all the alliterative ridiculousness that has glossed the precon decks of Return to Ravnica, is if nothing else quite rightly named. The deck’s objective is actually a very simple and even straightforward one, for all the tricks you might naturally expect from the Simic. In a nutshell, this deck wants you to ramp up your manabase at a frightening pace, then deploy massive closers to finish off your opponent. This being an Event Deck with the usual allocation of rare cards, though, the deck is also able to bake in a few combinations that give it even more fuel in the tank. Like many Event Decks, there is some doubt as to its viability in an actual Standard competitive environment. After all, there’s only so much you’ll typically get for the sticker price. As before, we’ll be looking at it from the preconstructed standpoint rather than a constructed one. With that in mind, we’ll begin by dividing the deck into two components. Most commonly we split the creatures from the supporting cards, but given the very focused nature of the deck today we’ll instead be dividing along the lines of role. First up, let’s take a look at the ramp suite. Being able to race out in front of your opponent is critical to the deck’s success. Much of the deck’s offensive space is given over to board development, so being able to overwhelm your opponent with a swarm of angry, fast, aggressive creatures isn’t really an option here. Instead, you’ll be relying upon a bench of fat ones, and the sooner you can deploy one the greater your advantage will be. The deck leads off with a playset of Arbor Elves. ‘Mana dorks’ have been a staple of Magic since the game’s inception with the Llanowar Elves, and the Arbor Elf was an innovation from Worldwake in a “land matters” block. Instead of offering mana of its own, the Elf simply untaps one of your Forests. This may seem like a semantic difference, but there’s more to it than that. Also in the deck is a playset of Verdant Havens, which enchant a land to make it produce more mana. With an Elf on board, you can get a second use out of the enchanted land, making the Elf in essence tap for two mana rather than one. Next up is a trio of Borderland Rangers in the three-drop slot. Reprinted in Avacyn Restored from its original inclusion in Magic 2010 (where it was a reskin of the Civic Wayfinder (itself from Ravnica, natch), the Ranger doesn’t so much ramp you as smooth out your mana development. If you’ve already played a land the turn you cast him you won’t be up any, but you’ll be certain to hit the drop following. Another serendipitous inclusion is Farseek, and here you get another full playset. Farseek too is an original Ravnica card reprinted in the Core Set, and it both ramps and fixes your manabase by getting any non-Forest basic land you need. These are superb for finding you your single Mountain needed to support the splash of Red the deck features. Finally, there’s a trio of Urban Evolutions. Coming in at five mana it’s a bit more difficult to consider these as ‘ramp,’ but they’re nicely suited as card draw with a big of ramp thrown in. All told, that’s nearly one-third of the deck given over to accelerating and steadying your manabase, in addition to the suite of nonbasic lands (two Evolving Wilds and a set of Simic Guildgates). The next question becomes, with all this land and mana sloshing about, what is Thrive and Thrash offering for you to do with it? Although most of its focus is tailored towards the high end of the mana curve- and with all this ramping why wouldn’t it be- the deck is not defenseless in the early game while it develops its board position. There are a pair of Fog Banks, which are about as good a defensive option as you get for the mana. There’s also a trio of Strangleroot Geists. One of Dark Ascension’s breakout cards, the Geists’ undying means that you can get a couple good uses out of them before they exit the battlefield. If you’re stalling for time, they can trade with a couple of attacks on successive turns, while their haste makes them potentially relevant even in the later game when the added surprise damage can make an impact. There’s also a pair of Ground Assaults, which scale wonderfully with the deck. An effective defense mechanism, this can easily and cheaply burn out most anything threatening you across the board thanks to the frequency with which you’ll be dropping lands into play. Although the splash of Red here has proven to be a bit controversial with the Magic community (in large part due to the ‘brand identity’ of the Simic Combine), there’s a compelling case to be made for its potency here. As these scale over the course of a game, they only get better the longer you hold on to them. The rest of the deck’s cards are focused in the 4-5+ mana range, and offer a wide range of options. To set the scene for the deck’s subtler interactions, it’s important to begin with the two setup pieces: Yeva, Nature’s Herald and the Deadeye Navigator. Both of these make your creature cards even stronger than they might ordinarily be. Yeva gives all of your Green creatures flash, useful both for bringing out surprise attackers at the end of your opponent’s turn as well as surprise blockers when they swing in on you. The Navigator is a bit trickier, letting you flicker whatever creature is soulbonded to it. This gives the paired creatures proof against removal, since you can simply blink them out of existence in response to any threat, but also gives added punch to your enters-the-battlefield (ETB) creatures. We’ve already seen the Borderland Rangers, but you also get a pair each of Acidic Slimes and Mist Ravens. Each useful on their own, the ability to trigger them over and over for can border on the obscene in a deck with a wealth of mana at its disposal. 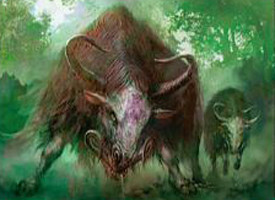 Uglier still is your Thragtusk, a chase rare from Magic 2013 that’s now seen print in three different Event Decks. Giving you a bonus on the way in (5 life) as well as on the way out (a 3/3 Beast token), the Thragtusk makes a natural and beautiful partnership with the Navigator, and will let you run away with the game if not stopped straightaway. If being able to repeatedly abuse ETB triggers wasn’t appealing enough, the Gruul Ragebeast compounds that pain with interest. This potentially turns most of your creatures into a removal spell by having it fight with an opposing creature when it arrives. Then there’s the Sphinx of Uthuun, which in addition to being an evasive fattie also gives you a free Fact or Fiction when it enters the battlefield. Although we rapidly approach best-case-scenario mentality here, the prospect of flicking a Sphinx with the Navigator while a Ragebeast is in play, refilling your hand while decimating your opponent’s army for only two mana a pop is truly living the dream. Rounding out the deck’s creatures is a Wolfir Silverheart and Dungeon Geists. When paired with another creature, the Silverheart is a massive 8/8 beatstick that can swing for a ton of damage. The Geists are a bit more subtle, being a 3/3 with flying. 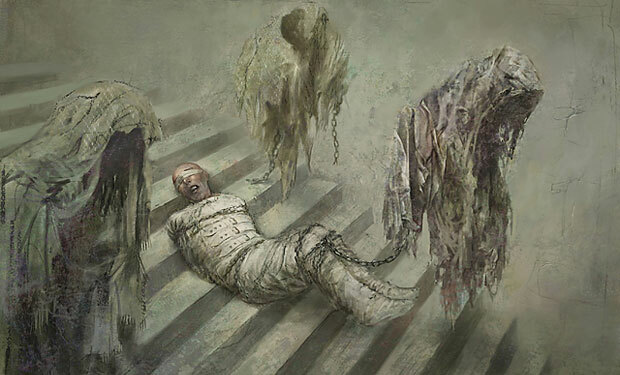 Their virtue is that they act as removal by locking down an opponent’s creature for the duration of their stay. Toss in a Bramblecrush for a little added noncreature removal, and you’ve got yourself a deck. The sideboard of Thrive and Thrash offers a few additional options to tailor the deck against your opposition, but doesn’t throw any great curves into the mix. Flames of the Firebrand is present to give the deck added spot removal, useful against decks with lots of creatures in the earlier game, before you can bring the deck’s engine on-line. The ability to distribute Flames’ damage as you see fit makes it ideal for gaining advantage over weenie/rush decks, since you can often pick off two or even three of their cards for the cost of your one. Dissipate and Negate are there for the opposite end of the spectrum, when facing off against slower control decks. Thrive and Thrash can be vulnerable to countermagic, since so much of your efficacy relies upon a small number of larger creatures. This gives you some ability to protect your investments, though given the uncounterability added to some spells in the block you might still be vulnerable to a Supreme Verdict. If your opponent manages to consistently mount a formidable defense against you, as with a stream of token creature chump-blockers, you might consider bringing on your Rancors. Cheap and efficient, the trample the auras bring alone can provide a massive boost to cards like your Wolfir Silverheart. Finally, against decks that employ auras or artifacts to great advantage you get a pair of Naturalizes. That’s all for Thrive and Thrash today, next we’ll be taking a look at the Boros-themed Rally and Rout before we pit the decks against one another. If they only make 1 event deck per set, how are you going to do their part 2 reviews? Will you use previous event decks? That being said, I’m still considering getting this. This definitely has some choice cards like a Strangleroot Geists, Wolfir Silverheart, a copy of Thragtusk (he sure is a popular one), and almost a full set of Rancor’s in the sideboard. Those alone almost justify the price. This looks like it plays like a straight U/G deck (albeit with a splash of Red for some Gruul fatties and occasional burn), main strategies being mana-ramping/fixing for beaters and (if you’re lucky) blinking via Deadeye Navigator where needed. I can see how strong would be after picking up some steam, and including the Fog Banks is a nice touch for board stall. Yeva will let us flash in Acidic Slime blockers or even a Mist Raven bounce when you need it. Urban Evolution looks like a great U/G card that fits well in this deck. Aaron above has a good idea. Adding a Swamp would allow for sideboarding a couple Golgari Charms. Looking forward to see how this performs! Ok, the rares are good, but no rare lands (which had become a staple in event decks) and no trace of the Simic guild. No evolve, not a single evolve card. This is just Simic in name, as it also brings red. Pretty dissapointed by this deck, at least in flavor, independently on how it fares against the boros.